The aroma of fresh sawdust . . . Recently I met with a priest for a long over due confession and he described to me this print, observing that it was a great example of Christian perseverance. Notice how the knight is unwavering in moving forward. Death and Satan do not distract him from his goal. In fact, the knight's undistracted resolve seem to communicate the same to his horse and dog as well. For, they too march forward looking straight ahead. "Yea, though I walk through the valley of the shadow of death, I shall fear no evil . . ."
While this is a masterpiece of draftsmanship, it is also inspiring as you consider the story that it tells. 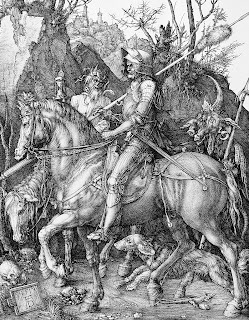 According to the Met: "The artist may have based his depiction of the 'Christian Knight' on an address from Erasmus's Instructions for the Christian Soldier (Enchiridion militis Christiani), published in 1504: 'In order that you may not be deterred from the path of virtue because it seems rough and dreary … and because you must constantly fight three unfair enemies—the flesh, the devil, and the world—this third rule shall be proposed to you: all of those spooks and phantoms which come upon you as if you were in the very gorges of Hades must be deemed for naught after the example of Virgil's Aeneas … Look not behind thee.'" The Sheaffer Balance that I won on Ebay came in last week, and it is a beauty! I filled it with Noodler's Marine Green ink - although I don't know how. What I mean is, I don't know how the filling system works. The end unscrews and a long plunger pulls out and when you push it back in there is a funny popping sound and there's ink in the pen. I read some history on Sheaffer who was quite the inventor and revolutionized the pen industry at the turn of the century - he invented the lever and bladder system for fountain pens, so that people would no longer have to fill them with eye-droppers. He also guaranteed the nibs for life, which you can see if you zoom in on the nib (with lingering green ink) pictured here. I think this pen dates back to the mid 1930s but I am not sure. This pen with a 14ct gold (extra?) fine point nib, is the smoothest and easiest writing pen I have ever used. It is a much smaller than what I expected, which is ironic because I returned a Levenger Decathlon because it felt too light weight and I wanted a a larger heavier pen. Well, not everything that is "vintage" is larger and heavier. The Sheaffer Balance is narrow and light weight but at least it is long enough at 5.5". The long and short of it is that you simply do not care because it writes so well. It probably appears as though I have nothing to write about but pens. Actually, I hope to have time in the near future to post some photos of my grandfather's and dad's old handtools, but I have to pull them out of storage before I can do that. One of the benefits of fountain pens is not only their unique beauty and utility; they take up very little space! Usually when I shop for a new fountain pen, I agonize over which one to get. The selection process can take quite awhile as I read and re-read different descriptions and reviews and struggle to stay within my budget. Not too long ago, I ordered a Libelle Autumn Leaves fountain pen for my wife. It is a nice looking pen but not one I would have chosen for myself. However, as soon as I saw the Winter Storm, I ordered one right away. It really does look like it is made of cracked ice! I also really appreciate the diameter and length - 5 inches without the cap. It is very comfortable: not too light and not overly heavy. It is available only with a medium nib. It writes very well - in fact this one writes more smoothly than the more costly Libelle Epic of which I have written earlier - even though they have the same style nib. Curiously, the Libelle Epic came with a rather flimsy converter, which is awkward to use. But the Winter Storm arrived with a better quality converter that operates well. A couple of my pens are nice to look at but not much fun to write with. Libelle really hit the mark with the Storm on style, form, size, price and color - and it writes well too. What more could you ask for? This is an unpleasant story to tell. And it becomes increasingly more unpleasant the more I learn about fountain pens . . . When I was in the USAF, stationed in So. Korea in 1987, I bought one of these fountain pens. I doubt if I spent more than twenty dollars for it, because I was a poor Senior Airman with a wife and newborn baby boy. The pen was very heavy. It felt like it was made out of a chrome bumper from a 1960 tail fin. Sometime after I moved back to the states, the bladder broke (the pen's, not mine) and I was too ignorant to know how to fix it. I took it to the local stationary store and they didn't have a clue. Since then I have lost it, or did I throw it away? I always really liked that pen, so I can't imagine that I threw it away. I keep hoping that I will rediscover it in some box somewhere. Recently, I discovered the value of it after seeing that Namiki still makes the exact same pen. But, now that sterling dragon pen is $475.00! Reading other blogs, such as Brassing Adds Character has opened up a new aspect of fountain pen collecting for me recently that I had not anticipated. 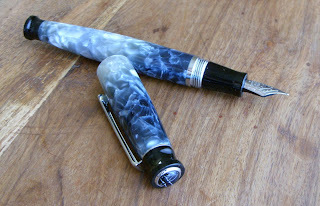 Every time in the past, that I have looked at old fountain pens in glass display cases at second hand stores, I have been disappointed by what I saw. They are always a sorry piece of tattered junk. So, I was much intrigued when I read Rroossinck's review of the "vintage Sheaffer Balance" in his "Best of Class under $80" post. I followed his links to vintage pen dealers and discovered to my disappointment that they were out of my price range. Next, I reluctantly followed his advice to check Ebay. I say "reluctantly" because I have never much cared for Ebay. I fear I may now be hooked. I lost the bidding for my first choice (the pen above on the green felt) because the automated snipe tool failed to work. I was watching the bidding online seeing no one outbid what I knew was my maximum bid when suddenly the bid closed and someone else won the bid with an offer slightly below my maximum bid. Oh, the agony of defeat! The sniping software service was itself sniped by constipated internet activity and could not submit my bid. So, as a wiser bidder, (Thank you to Jacqui for teaching me the ways of Ebay) I went to my second choice pen and followed the bidding without the use of the snipe tool. The result being that I won the bid on the vintage Sheaffer Senior Balance 14ct gold nib pen pictured next. The picture is not as clear as the first one above but the description indicated the pen was hardly used. We'll know for sure when it arrives in the mail and I will report on whether or not it was a good buy after all. Here I present a photograph of one of my grandfather Clayton's planes sitting on my table saw. I have planes from both of my grand fathers and my father. I love those old hand tools, but not simply as collectors items - I use them every chance I get. One of the best things about having a house built in 1945, is that it gives me many opportunities to use my tools. The planes are my favorite wood-working tool. Few things in life are more satisfying than carefully trimming down a piece of wood with a sharp, properly adjusted plane. And, the two best aromas of life can readily be experienced together: fresh sawdust and wood chips, with a strong cup of coffee.